The reason whales vocalize is still a mystery. Some species are able to use echolocation, though the songs are traditionally believed to lure a mate, or at least others of its own kind. 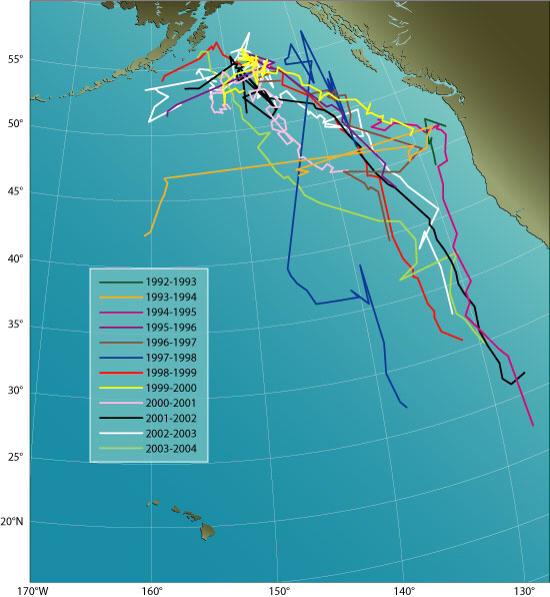 But there is one whale – species unknown – that has been navigating the Pacific Ocean for more than 2 decades without an answer to its call. In fact, it sings at a different frequency than any other whale ever recorded. The "52-hertz whale," as it is referred to, was first detected in 1989 by the Woods Hole Oceanographic Institution and has been heard every year since as it travels the thousands of miles back and forth between the Aleutian Islands and the California coast (THE MAP ABOVE SHOWS ITS TRACK OVER JUST A 12-YEAR PERIOD). Neither his migration routes nor his calls are the same as any other whale, leading to his reputation as the loneliest whale in the world. Oceanographer Kate Stafford of the National Marine Mammal Laboratory concludes, "He's saying, 'Hey I'm out here.' Well, nobody is phoning home."